About five years ago, the New York Times published an article chronicling the rising tide of gout in America. The paper took great pains to point out that this erstwhile “disease of kings” is no longer limited to the kingly, i.e. the wealthy. 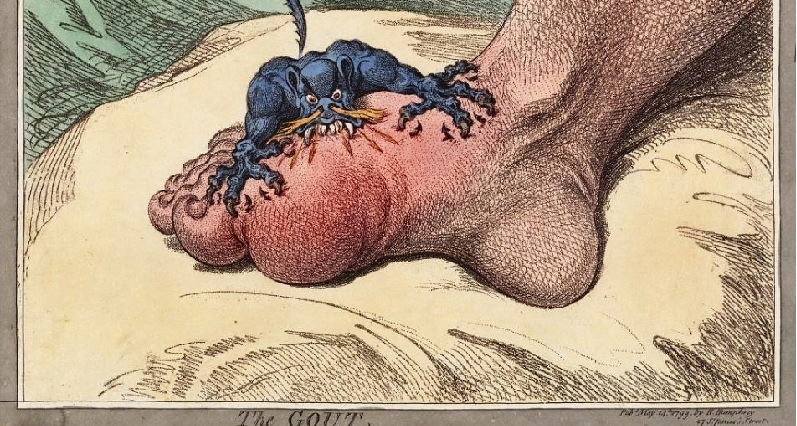 Now that the poor and middle classes have access to plentiful rich foods and copious alcohol, gout is well within the reach of the rest of us. And even among the thin, young, and clean-living, gout appears to be on the rise. Milk, on the other hand, is almost purine-free, because it doesn’t do anything in the animal. Research aside, here’s what I know: dark cherries work better than Rainier cherries, and tart (Montmorency) cherries work the best. A cup of juice a day is a good daily practice to prevent attacks. At the very least, the black cherry juice sure beats O.J. on taste. (There’s also been research where daily cherry intake reduces soreness after working out.) During an acute attack, you might want to down a quart or more of cheer juice a day. Or you can get cherry juice concentrate and add it to sparkling mineral water to make a therapeutic, refined sugar-free “soda.” I like Gerolsteiner mineral water for flavor, and I like the fact that it also kicks in some natural calcium. Duke like to talk about how he took allopurinal daily for nearly two decades to control his gout; how he switched to celery seed five years ago, and hasn’t had an attack since. How he danced barefoot and drank Peruvian rum and still didn’t get gout. James Duke is always a storyteller.